Capilano University uses Moodle as its online learning management system for online and mixed-mode courses as well as to supplement face-to-face courses. Check out what's new in Moodle v.3.3 effective May 1, 2018! Faculty, please contact IT Service Desk for Moodle help, individual or group workshops/training, login and other technical issues. for login, password and other technical issues. Please familiarize yourself with these important changes and new features that will be implemented on May 3, 2019. Last updated on April 15th. All new Messages will be highlighted on the Messages icon to the left of your login name located on the top right corner of your Moodle page. if you use the Assignment Activity for marking you may have noticed a new PDF Grading screen that appeared during last summer's upgrade. This will now be off by default for all newly created Assignments. Older Assignments that have been imported into new Course sites will still show the PDF grading screen but it can now be turned off in the Assignment settings. As part of this upgrade, we are introducing eLearn.capu.ca as a new link to Moodle (note that the previous link will redirect to this one for a period of time); this will align with our upcoming Moodle app, branded ‘eLearn’. (note that the previous link will redirect to this one for a period of time); this will align with our upcoming Moodle app, branded ‘eLearn’. On campus you will be logged into Moodle using the username you sign in to the computer with. Off campus employees can sign in once and won’t be prompted again when accessing other services (i.e. Frontlines, Moodle, Office365, and so on). Students will also be able to log in once and access various online services (i.e. Moodle, Office 365 and their email). Please familiarize yourself with these important changes and new features that will be implemented on May 1, 2018. MISSED LAST SUMMER'S MOST SIGNIFICANT CHANGES? Moodle 3.2 focuses on improving the user experience and on accessibility. Please familiarize yourself with these important changes and new features that will be implemented on May 2, 2017. How Can I use Moodle to Email my Students? Select Quickmail from the list of menu options - if you do not see Quickmail as an option that means it likely already exists in your course site. Look for it on the right where all the blocks appear. Please check back soon - more information to come!! Your Moodle Username and Password are the same credentials that you use to log into your office or lab computers on campus or to access your email remotely. Is this your first time logging in? If so you must first log into the Employee Web Services website with the username and temporary password provided to you and you will then be prompted to choose your own password. Once you have successfully done this you can proceed to log into Moodle using your username and new password. Not your first time logging in? But still cannot log into Moodle? it is likely your account has expired. Log into the Employee Web Services website and if your password has expired you will be prompted to change it. You will then be able to log into Moodle with your new password. How do I find my course(s)? There may be more than one page listing for each category, make sure you navigate to the next page if your course doesn't show up on the 1st page. If you are logged in and still cannot find your course in your My Courses list please contact IT Services. How do I upload a file for my students to see? Students will not be able to access your Moodle site until you make it VISIBLE. Click here for instructions on how to do this. Need more help managing your Moodle course? You can find some great information for managing your course at Moodle.org. << Additional help files and screen-casts can be found by topic within the menu on the left. Contact IT Services to book a consultation with a Moodle trainer. While Capilano University's Moodle site is built using a mobile-friendly, responsive theme, the Moodle Mobile App can offer both students and faculty a more streamlined mobile-friendly experience. Please note however, not all functionality may be available on the Mobile App. The copying and use of all materials at Capilano University – including the posting of material to Moodle – is governed by the Canadian Copyright Act, guided by the University's Fair Dealing (Copyright) Policy, and (in the case of subscribed electronic resources) regulated by individual licenses. Please ensure that the posting of any file (document, image, etc.) to Moodle complies with copyright or licensing requirements. Best practice is to link to the original material when able. This includes to material available on the Internet and to material in licensed resources. To learn how to create a persistent link to licensed material, see this instructional video or contact your liaison librarian. Can I post items scanned from copyright protected print materials in Moodle? Can I post the electronic version of an article retrieved from a Library research database or subscription journal in Moodle? For more FAQs and additional information, consult Capilano University’s Copyright guide or contact copyright@capilanou.ca. Courses will reside on Moodle for one year (plus one term) at which time they will be archived (backed up and saved to a storage area). Once the courses have been archived they will be deleted from the Moodle server. What if I am still using an older term course with students and it is about to be archived? How do I know if my Moodle course resides in category that is about to be archived? What information is saved in an archived course? How do I make sure my archived courses will always contain student data? Can I access my course after it is archived? I have a site in the Departments' category, will this be archived? If you are teaching a cross-term course and are still actively using a course site that resides in a category that is about to be archived you must back up the course and restore it with user data into one of your existing course shells. How do I know if my Moodle course resides in a category that is about to be archived? Academic courses that reside in term categories will be archived. These courses will generally have the term in the course name (for example, BADM 101 01 - Fall 2015). If the course is in a term category and is one year old (for example BADM 101 01 - Fall 2014) it will be archived in the next round of archives beginning the next semester (Spring 2016). The state of an archived course will be the same as it was when it was last edited/changed. For example, if the course was reset the archive will not contain any student data. Most courses will be archived with student data - as a general rule most instructors do not reset their courses. At the end of each term, do not reset your course. Simply make your course unavailable to students. This will remove student access while keeping all of the student data intact. The course instance including the student data will be available to you up to a period of one year at which point it will be archived and moved off the server. Yes, archived courses will be stored on a server in the form of a backup file. If you want to restore an archived version of a course instance you may request this by contacting IT Services. No, there are no plans to archive Department sites at this time. If a site remains unused for a long period of time, we may contact you to determine if it is still needed. Students must first log in to the Moodle website using their Username and password that was assigned to them upon registration. Commencing with the Summer 2015 term courses, students will be automatically enrolled into Moodle course sites. When students log into Moodle, the courses they are registered in will appear under their "My courses" list - just as they do for you - automatically. Students will not have access to or know the course site exists until the instructor makes it available. Daily synchronization with Banner will ensure that all course sites are up to date, including late enrolments and dropouts. Instructors must also make sure their course sites are visible before students can access them. How do I make my course site visible? Check out the FAQs below for more detail and contact itservicedesk@capilanou.ca or call 4952 (604.984.4952) with any additional questions or concerns you may have! What if I don't use Moodle? Will the students see an empty site for my course? Does this mean that I don't have to wait to send notices to students using the News Forum? How do I get a Moodle course site? How do I get content into my Moodle course site? Why is my name not showing up at the end of my Moodle course site anymore? How do students access my Moodle course site? Can any student get into my Moodle course site? What happens if students are late registering to my class? What happens if a student drops my class? What happens if a student is inadvertently removed from my Moodle course along with all of his/her course data? Can I add students to my course site that are not actually registered in my class? No. Students will not have access to course sites that are not made available by the teacher. If you do not use Moodle you do not need to do anything, the course shell that is generated will remain inactive and unavailable to students. You can post as many messages as you like in the News Forum for your students to read once they gain access to the site however, the messages will not be forwarded to their email until you make the course visible. By making your course visible, you are making it available to your students and they will then be able to enter the course site and receive messages that are initiated through Moodle. Instructor names were originally appended to course site names so that it would make it easier for students to be able to find the right course site in which to self enrol. Now that student enrolment into course sites is automated there is no longer a need for this. Students will be automatically enrolled into Moodle course sites. When students log into Moodle, the courses they are registered in will appear in their My Courses list just as they do for you, automatically. However, students will not have access or know the course site exists until you make it visible. At the end of each term, by default, students will remain in the course site and will still have access (this will accommodate any course that runs cross-term. Faculty who wish to remove students when a course is finished simply need to make the course unavailable to students by hiding it. This option removes student access while retaining all of the student data. Only students that are registered in your course will be automatically added. If you want to invite other students into your Moodle your course site you can do so by adding them manually. Daily synchronization with Banner will ensure that all course sites are up to date with late enrolments. Daily synchronization with Banner will ensure that all course sites are up to date with drops. What happens if a student is inadvertently removed from my Moodle course along with all of their course data (eg, quiz results, grades, etc.)? The student, along with all of their course data, will re-appear in your Moodle course site one day after is replaced in the Banner system. If the student requires immediate access to the site and cannot wait for this process they can be added back to the course site manually by the teacher or a Moodle Administrator. Can I add students to my course site that are not registered in my class? 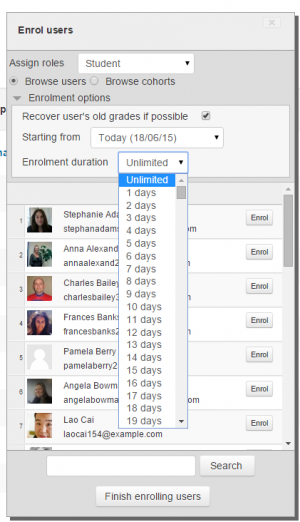 You can add any number of additional users to your course site. These can be students that are not yet registered, colleagues, etc. Students can be added to course sites manually. From the Assign roles drop down list choose the role of the person you wish to add i.e. Teacher, Student etc. Students can also access Moodle course sites using the Self enrolment method. This allows students to enroll themselves in Moodle courses. Teachers must first designate an enrollment key - or password - to grant students access to their course site. This enrollment key can be given to students during class or by email using the Class Email Distribution List. Click on the large Gear icon on the top right of your course. ** IMPORTANT ** At the end of the term this setting should be set back to HIDE. This removes student access to your course site and in turn removes the course from the student's Dashboard. Use the 'Assign roles' dropdown if you wish to change the role. To enrol users individually, click the Browse users button. It should be selected by default. Click the Add method button on the bottom of the page to save changes. Go to the course you wish to add Guest access. Go to the Gear Icon (top right of page) → More → Users tab → Enrollment Methods. If Guest access is not already listed, select Add Method → Guest Access. If Guest Access is listed, click on the gear icon to modify the settings. Turn on guest access and optionally set a password. Click the small Enrol button opposite the user. The user will indent in the list and the enrol button will disappear, indicating that the user is enrolled. How do I copy an entire course (or part of a course) into another course site? This allows you to empty a course of user data, while retaining the activities and other settings. There is a block available that will let you mass delete items in your course. If you have a lot of content you wish to get rid of in one pass you can use this new feature. Make a backup first if you want to be safe when using this feature (in case you delete the wrong item by mistake). Turn your editing on and under Add a Block choose Mass Actions. Resize your browser so it places the checkmark closer to the actual item you are selecting. Once you have selected the items you want to delete, hide or move click the relevant icon in the mass actions block. (delete, hide or move to another section). The Moodle Quickmail block is a block that appears on the right side of your course and allows you to send email to participants or instructors in your course. Quickmail sends email but does not receive email. Quickmail sends email to user’s Cap email addresses – not their personal email. Navigate to the main course page. Click Turn editing on from the drop down list. Next click on Add a block at the bottom of the navigation drawer on the left side of the screen (click on the three lined “hamburger” at the top left of your screen if you don’t see the left navigation drawer in your course). The Quickmail block will be visible on the right-side of the main course page. You can move the Quickmail block up or down by dragging on the four-arrow button shown below (editing must be turned on). After dragging the block to where you want it, reload the page to ensure that it stays there. If after reloading the block is not where you want it again, try dragging the other blocks into place and reload again. Learn how to add video to your Moodle course. Visit this page. Why a page and not a file? Opens seamlessly - no clunky attempts to launch third party software (e.g. Microsoft Word) which some users may not be able to access. Your students may need to refer to it (on their smartphone for example) frequently for reference e.g. timetable, schedule, tutorial groups, reading list. Log in, go to your course page, click on the "gear" icon on the top right and choose Turn editing on from the drop down list. In the section where you want the link to your Page to appear, click its Add a resource link; the pop-up menu displays. From the menu select Page; the Adding A New Page To Topic [X] page loads containing the settings for your new Page. In its Name field, enter a title - this will eventually appear as a link on your course page so keep it concise but descriptive. In its Description field, enter a concise description no longer than index length. If the Name is insufficient on its own to communicate the contents of your new Page, then select the checkbox to Display Description on Course Page. Into the Page Content field you can then enter the content of your page including a range of media as needed. N.b. if you are pasting from an existing document e.g. word processed, you'll need to follow the instructions below. The remaining fields stipulate who can access the page and when - complete these as appropriate. Ensure all fields with asterisks are complete, and when you are ready click the Save And Display button at the bottom of the page; your new Page loads. If you need to make subsequent changes, to edit the Page you can either open it and in its Settings block click Edit Settings, or from your course page (after you've Turned Editing On) you can click its adjacent Update icon. To safeguard against unpredictable, ugly, and inaccessible results, it's important to take some easy extra steps when pasting word processed and other text into web authoring software including Moodle. Open the document containing the text you want to paste into your new Page, and copy that text ready to paste. Follow steps 1-6 for the section above on 'Typing directly into the editor'. If you want to keep the original formatting then click the Paste From Word icon; a pane loads containing an empty text field and you can press your keyboard's Control and V keys to paste what you copied into the text field; then click the Insert button; your text appears and can be edited within learn.gold. N.b. if the original formatting does not conform to Web accessibility requirements, it won't be transferred. Alternatively, if you want to strip away all formatting, rather than the Paste From Word icon you instead click the Paste As Plain Text icon and proceed to paste directly. Follow steps 8-9 for the section above on 'Typing directly into the editor'. On your course page click on the "gear" icon at the top right and then choose Turn editing on from the drop down list. Editing icons and links will appear. Locate the Topic or Weekly Section where you will add the Folder. (If you are using the Collapsed topics format, open the Section.). Click Add an activity or resource. The Activity chooser will open. In the Activity chooser, scroll down to the Resources heading and select Folder. Then click Add. The Adding a new folder page will open. In the Name field, provide a title for your folder (required). The name you enter will display as the link to the folder on your course page. In the Description field, add a description (required). To display the description on the course page, check Display description on course page. Arrange your computer's windows so that you can view both the Files area in Moodle and the files on your computer. Drag files from your computer onto the large blue arrow in the Moodle Files area. Note: To upload multiple files at once, hold down the CTRL key on your keyboard (Windows), or the COMMAND key (MAC), and click to select multiple files. Then drag the files into the Files area in Moodle. For directions on zipping files, see Create a ZIP File (below). Click Add.... (at top left of Files area). The File picker pop-up window will open. Click Upload a file (top left) and then click Browse to search for the .zip file on your computer. Click Upload this file. The File picker window will close and the .zip file will be listed in the Files area. In the Files box, click the .zip file icon. A pop-up window for the file will open. Click Unzip (at top). (Optional) You can delete the .zip file, or leave it in the folder to allow students to download all the files at once to unzip on their own computers. To delete it, click the .zip file again and then click Delete (at top) in the pop-up window. Click OK to confirm the deletion. The pop-up window will close and the .zip file will be gone. Select how folder contents should be displayed: On a separate page or Inline on a course page. Next, select whether subfolders should be expanded. Click Save and return to course (at-bottom) to complete the file upload process. The Folder will appear in the Topic or Weekly Section. Click here for a print-friendly copy of this page! Note: In order to restore student data, you must back up student data first. If you did not include student data when you backed up your course site the student data options will be disabled by default. See Backup Procedures for more information. "Available but not shown on course page" hides the item on the home page of the course. Students can interact with that item only if you linked to it from somewhere else. You can choose this in the settings when creating the item or later in the drop down under "Edit" for the item. To make an item on the course home page visible to students, be sure to click on Show in the Edit options. Design consideration and tips for Moodle course creation. Responsive web design (RWD) is becoming the next standard on the web. Learn how to create an optimal viewing experience on multiple devices - from desktop computers to cell phones or tablets. RWD websites are designed to be easy to read and navigate, no matter which device they are viewed on. Most people today can hardly conceive of life without the internet. It provides access to news, email, shopping, and entertainment, at any hour of the day or night. Some have argued that no other single invention has been more revolutionary since Gutenberg's printing press in the 1400s. Now, at the click of a mouse, the world can be "at your fingertips"—that is, if you can use a mouse... and see the screen... and hear the audio—in other words, if you don't have a disability of any kind. The web site WebAIM provides articles that should help you understand how people with disabilities use the web, the frustrations they feel when they cannot access the web, and what you can do to make your sites more accessible. The editor in Moodle has changed with the latest version of Moodle. It is called Atto and has less options than the previous TinyMCE editor. The reason for this is to try to ensure that content created for courses is “accessible” to students with disabilities. Accessibility is becoming more and more important to schools around the world – Cap included. There have been lawsuits brought against universities so our policy towards accessibility will probably be more rigorously enforced in years to come. Also, as we are in an era where most students (some estimate 80%) access their web content on mobile devices, some of the traditional desktop designs do not transition well to those devices. “Simpler” is better for viewing there. Moodle is positioning itself to provide accessible content as well as content that works effectively in a mobile environment. All that being said, you can still choose to use the previous editor for now. If you go to Administration/My profile settings you can change back to the old editor under Edit profile/Preferences/Text editor. You will find a drop down box there. Choose TinyMCE HTML editor. Click the Update Profile button at the bottom and you will revert back. Before you do this you might want to use the Accessibility Checker button (bottom row to the left of the “ear”) on your current content to get a report on how compliant your content is. Accessible Education is the process of designing courses and developing a teaching style to meet the needs of people from a variety of backgrounds, abilities and learning styles. Just as there is no single way to teach, people learn in a variety of ways; using different instructional methods will help meet the needs of the greatest number of learners. The Educators’ Accessibility Toolkit provides guidelines and tips on how to make your courses and your teaching more accessible to students. These tips are in line with research on best practices in teaching and learning. How to Make Word and PDF documents accessible to students with disablities. If you distribute content to students using Word or PDF files everyone benefits from organized, clear, concise and well laid-out assignments, syllabi and handouts. These tips can help you make your Word documents and PDFs accessible to the greatest number of students. Though estimates vary, most studies find that about one fifth (20%) of the population has some kind of disability. Not all of these people have disabilities that make it difficult for them to access the internet, but it is still a significant portion of the population. Businesses would be unwise to purposely exclude 20, 10, or even 5 percent of their potential customers from their web sites. For schools, universities, and government entities it would not only be unwise, but in many cases, it would also break the law. WebAIM provides some of the basic principles to apply to accessible web design. PDF files are not typically created in Acrobat. They are usually created in another program and converted to PDF. There are dozens or probably hundreds of programs that can create PDF files, but very few of them produce tagged PDF files. If you are using Microsoft Word or PowerPoint, OpenOffice.org Writer, or Adobe tools such as InDesign, you can often create accessible, tagged PDF files without opening Acrobat. Of course, the accessibility of the PDF depends on the accessibility of the original document. Attendance is a feature that allows instructors to report attendance in face-to-face classes into Moodle. Attendance reports can be viewed by both the instructor and the student, and a grade can be assigned. Instructors are able to customize the attendance status descriptions (i.e. present, absent, late, etc.) and the grade associated with each. Follow the steps below to add an Attendance module to one or more of the sections of the course. Click Turn editing on at the top right of the course home page. Click Add an activity or resource in the section where you would like the attendance to be listed on the course main page. Select Attendance in the pop-up under Activities, and then click Add. The Attendance settings page appears. Click Expand all to expand each of the sections and reveal the options. Note that it is possible to hide the attendance from students. See step one in the next section, Common Module Settings, for instructions.Enter an alternate title in the Name field if you prefer a different title. This name will appear as a link for both students and instructors to access the Attendance on the course main page. Select a Grade to be assigned to attendance from the drop-down list. Leave the Visible drop-down at Show if you want your students to be able to view their attendance, or select hide if you do not. Restrict access options allow you to set restrictions on an activity or resource by date & time, or by conditions related to previous activities. Set conditions for activity completion as required. Refer to the Restricting access to resource and activity training page for setting up restriction criteria. Click Save and display to set up Attendance. The Attendance for the course set up page appears with multiple tabs across the top. You can customize the attendance status variables to suit your needs. The default variables are: Present, Late, Excused and Absent. You can also assign a point value for each variable if you have chosen to grade attendance. Click the Settings tab in the Attendance for the course page. Change any of the Acronyms or Descriptions as required. The acronyms represent the variable at the top of the column when taking attendance. Change the Grade for each associated variable if applicable. Enter an appropriate Acronym, Description and Grade (if applicable) in the corresponding columns of the empty row. Click Add. Your new variable appears on the list and another blank row appears. You can delete any variables you create by clicking the icon in the Action column. Only variables that you create can be deleted. Other variables can be hidden if not required. You can hide any of the existing variables from the attendance. For example, you may only want to use two variable (i.e. Present and Absent). Click the icon in the Action column. The variable no longer appears as a status option when taking attendance. To make the option available again, click the icon. In order to take attendance, you first need to add the sessions. The sessions are a list of classes, tutorials, lab or other class meetings organized by date. You can add multiple sessions for regularly repeating sessions or add several instances of attendance sessions for different types of classes (i.e. lectures, labs, tutorials) or for groups. Follow the instructions below to add one or multiple sessions for a single slass type. Click the Add tab in the Attendance for the course page. Configure the sessions(s) as required. Session type: Depending on how you configured Group mode, you may or may not have any options. Common refers to the entire class, and Group will allow you to include the members of one or more groups in the list of students. When set to Groups, you can select one or more groups to include (by holding down the Control key and clicking the group names) in the Groups box. Create multiple sessions: Enable this option if you want to add repeating sessions. (i.e. every Monday and Wednesday at 10 am for the semester). Session Date: Use the drop-down lists to select the date and start time of the session. If you have enable multiple sessions, this will be the first day of class. Duration: Enter the duration of the class in hours and minutes using the drop-down lists. Session end date: Use the drop-down lists to select the date of the last day of classes. This option is only available if Create multiple sessions is enabled. Session Days: Select the day(s) the class is held. This option is only availble if Create multiple sessions is enabled. Frequency: Enter the frequency of the meetings in weeks. For example, if the class meets every week on Mondays, the frequency will be 1. If the class meets every other week on Mondays, the frequency will be 2, etc. This option is only availble if Create multiple sessions is enabled. Description: Enter the name of the name or type of class as it will appear in the attendance records. Different types of classes can be added separately if requried. Click Add session to complete the task. You will get a message that your sessions have been added. To view your sessions, click the Sessions tab at the top. Repeat steps one through three to add another session or a different set of sessions, such as Lab or Tutorials. Once you have customized your attendance status variables and added the sessions to the activity, you can begin recording attendance from the Sessions tab. On this page, a list of your sessions appears, which can be filtered by month, week or day using the buttons below the tabs to the right. In the Action column of each session row, there are three icons. Click this icon to record attendance for corresponding session. This option only appears if attendance has not yet been recorded. Click this icon to make changes to attendance that has already been recorded. This option only appears once Attendance has been recorded. Click this icon to edit the corresponding session details, such as date, time, duration and description. Click this icon to delete the corresponding session. Follow the instructions below to record attendance for your class. Click the Sessions tab in the Attendance for the course page. Click the icon in the Action column of the corresponding row of the session to record. A new page displays the session information at the top, a list of the students and the attendance options for each. It is possible to record each student's attendance status in once click by clicking the corresponding red letter at the top of the coloumn. For example, if you wanted to mark all students present, you would click the red "P" in the top row of the register. Select the appropriate attendance status for each student and write any notes in the Remarks boxes. Note that students will see your remarks. Click Save attendance to save the entry. You can view a summary of attendance by clicking the Report tab at the top. It will show each student's attendance status for each lesson and their grade if applicable. If required, you can also download an Excel version of the attendance record by clicking the Export tab. The file includes student ID, username, first and last names along with the each student's attendance status for each session, and their grade if applicable. How can I add Grades to Moodle and allow students to access them? There are different ways of containing and displaying grades in Moodle. There are pros and cons to each method. By default, all new Moodle course sites use Simple Weighted Mean of Grades. If you have imported content from a previous Moodle course site, the Gradebook will be set up with the aggregation method used in the imported course. Grades can be entered in multiple locations in Moodle. There are advantages to each, for example entering grades from the Assignment has the advantage that it will send a notification to the student when the grade is submitted. This will not happen when the grade is edited from the grader report or single view screen. You can review the Quick Grading Guide at Moodle.org to see a brief description of each method to determine what will work best for you! Everything else you need to know about Grading and using the Gradebook in Moodle can be found on the following pages (or you can continue to view our custom help pages, with step-by-step instructions on frequently used features, by navigating to the next page of this article). Why would you want to do this? To track student progress and to allow students to view their own progress. Why would you want to do this? Quick grading is best for entering grades without adding feedback comments or feedback files. Why would you want to do this? The majority of your student grades might be the same value, for example everyone gets 1 point for participation. It is easier to enter these values all at once. Why would you want to do this? You might be required to submit your grades to your Administrator or you might want to keep a hard copy of the students' grades on file. Go to the gradebook and click on the Setup tab. Select Course grade settings beneath it. Scroll down to the Grade item settings area. Letter: displays only the letter grade. Letter (real): displays the letter grade with the points total in parentheses. Letter (percentage): displays the letter grade with the percentage in parentheses. Advanced Grading Topics, eg, offline marking, upload multiple feedback files at once, blind marking, rubrics, etc. Why would you want to do this? To allow students to upload one or more files to you, to allow students to submit some online text to you or you may just want to utilize the Assignment features for one of your offline class activities. Features such as grading, using a rubric or providing feedback to your students online. Go to the assignment in your course that you wish to grant an extension in and then click on “View/grade all submissions”. Once you are on the Grading page put checks in the boxes next to the students you wish to give an extension to. From the drop down box to the right of that choose “Grant extension”. Click the “Go” button to the right and then click the “OK” button on the popup box to confirm the students you wish to grant an extension to (if there is only one student it will ask you if you want to do this for "All" students)..
Now change the “Extension due date” to whatever date you want and click on “Save changes”. In the Administration block on the left under Assignment administration click on “Edit settings”. Once there scroll down to the bottom of the page to “Restrict access”. Click on this to open it. Set the date in the “Allow access from” settings that you wish to open this assignment to your students on. At the bottom of this block set “While access is prevented” choose “Hide activity entirely in the course and the gradebook” from the drop down list. This will entirely hide the link to the assignment from students on the home page until the date you have set. If you wish them to see a grey link that is not clickable leave this as the default choice. They will then be able to see what is upcoming but won’t be able to click on it until the date you set to allow access. Safe Exam Browser is a web browser (like Internet Explorer, Google Chrome, etc.) that features a lock-down system when in use. It directly integrates with Moodle and it can be found in most of the computer labs in the North Vancouver and Sechelt campuses (see full list below). Anyone who uses this browser will not be able to navigate away from it at any time after it is opened. For example, once the browser is opened, you will be not be able to open any new tabs or windows or access the desktop or network drives. Therefore if your exam requires the student to have this functionality do not use this browser. NOTE: If the questions exist in a Quiz on your Moodle site, those questions will not be deleted. They will remain in the Quiz. If you plan to re-use the quizzes that contain the questions you are deleting from the bank then you must also remove the questions from the Quiz. NOTE: You cannot remove questions from a Quiz that has attempts. You must either remove the attempts or import the quiz into a new course site and then remove the questions. You can set your quiz in Moodle to shuffle the questions by choosing Shuffle randomly within Layout >> Question order in your Quiz settings. You can further shuffle within questions by choosing Yes within Question behavior >> Shuffle within questions in your Quiz settings. Note: these are steps specific to importing a series of quiz questions that have already been generated using a 3rd party tool such as Test Gen and exported in a format Moodle is able to read (such as blackboard). You can create your own quizzes using the "Cloze" quiz coding format. Here is an excellent video that demonstrates this process. This type of Forum might be useful for when you want to ask one specific question and have the students reply to your question. The students can also reply to others' responses to your question. EACH PERSON POSTS ONE DISCUSSION - Each student can post exactly one new discussion topic, which everyone can then reply to. This type of Forum might be useful for when you want to have 'Introductions' or 'icebreaker discussions'. Each student is limited to creating just one discussion item where they can introduce themselves. Both the teacher and other students can then reply. Q AND A FORUM - Students must first post their perspectives before viewing other students' posts. This type of Forum might be useful when you want to encourage original thought as it keeps the students from seeing other students' posts until he/she has submitted his/her own post first. Moodle Technical Help Forum - students can post their questions around any technical problems they are having with Moodle and other students are encouraged to help their peers by replying to them. The instructor can choose to moderate this type of discussion forum or leave it as a student-only forum. Course Assignments Help Forum - students can post discussion items around any questions they may have around the course assignments. Other students can be encouraged to help their peers by replying to them. The instructor would probably want to moderate this type of forum to make sure the students were accurately relaying correct information. Group work - using Moodle's Group functionality, you can allow students to use discussion forum areas that are accessible only to their respective groups. All group discussions are viewable to the instructor. STANDARD FORUM DISPLAYED IN A BLOG-LIKE FORMAT - An open forum where anyone can start a new discussion at any time, and in which discussion topics are displayed on one page with "Discuss this topic" links. Everything else you need to know about using Forums in Moodle can be found on the following pages (or you can continue to view our custom help pages, with step-by-step instructions on frequently used features, by navigating to the next page of this article. Here’s a YouTube video that gives a general overview of how to create forums in Moodle. Why would you want to do this? For grading purposes. Why would you want to do this? This might be useful for Peer Assessment or to flag 'useful' posts in a Help Forum using a custom text scale. By default only the Teacher can see all of the ratings and the detail. The student will not be able to see what their ratings are and who rated them. They will however, be able to see some detail depending on what the Teacher has configured in the Forum. For example, if count of ratings, they may see that 6 students rated their post. Why would you want to do this? For marking purposes. TIP #1: You can print the page of forum posts by using your browser print option (File, Print). NOTE: if there is more than one page of results you will have to print each page view separately. TIP #2: Make sure your docks are blocked and that your editing is turned off to maximize your screen size for viewing and printing. TIP #3: Try doing a Print Preview first to see what the print job will look like. You can decrease the number of pages by decreasing the scale (also known as zoom or print size) to a lesser percentage such as 60%. Why would you want to do this? To make Forums 'read only' so your students can access the information on the Forums but can no longer reply to posts or create new ones. Here is a video explaining how to use the Moodle forums permissions settings to lock form posts. The library offers streaming video for teaching and learning among the video options in our collections work. Embeddable and linkable videos from Library collections are something to consider in addition to what you might find on the open web. Selected titles are constantly under development and renewal so please checkout the latest on what is available via our library webpages and our website announcements. Discover library video for your moodle site or other classroom use. Oh yes and what is posted from our licensed video platforms is always learning-ready and copyright-compliant! Questions? Just ask we are happy to help. Faculty can now create reading lists in their courses. One or more reading lists can be added to a course. To add a reading list turn editing on in your course and click on "Add and activity or resource" at the bottom of the topic or weekly block you wish to add it to. Under the Activities section of the pop up window choose External Tool. Click "Add". You will be taken to a page where you can configure your reading list. Watch this video for details of how to configure the reading list and to see both the faculty and student views of the plug in. Glossary entries can be exported and then imported into another glossary. 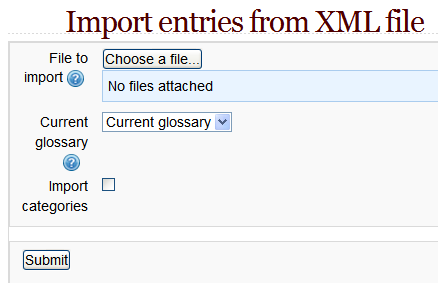 In Settings > Glossary administration > Export entries click the "Export entries to file" button. Save the automatically generated XML file on your computer. When the entries are imported into another glossary, the user performing the import will be listed as author of all the entries. A copy of a glossary may also be made by backing up the activity. 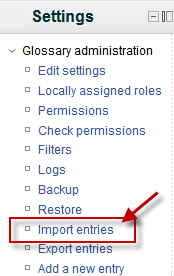 To include glossary entries in the backup, 'Include enrolled users' must be ticked in the initial backup settings. When the glossary is restored, the authors of the entries will be the same as in the original glossary. Glossary entries can be exported and then imported into another glossary via an XML file. If you want to import category information, click the checkbox. You'll then see a report of the entries and categories added to the glossary. If you enabled duplicate entries when you created the glossary, the import process will add all of the new definitions. Otherwise, it will not allow you to import any duplicate entries. You will be listed as author of all the entries. This YouTube video gives a good basic overview of how to set up and use the Workshop Activity. For more detailed information on the types of feedback questions you can add you can refer to Moodle.org Building Feedback page. Why does my video link embed my video instead of linking to another site? Adding a video to a Label will mean it displays as soon as the user clicks on that course page. This can be beneficial if the video is, for example, an introduction to the course or an integral part of the whole course. However, if there are several videos in labels, they can slow the loading of the course down, especially if the videos are coming from an external site. Adding a video to a Page in Moodle means that the user has to click a text link to reach the video, but it doesn't clutter up the main course page and it is a better choice if the course contains a large number of videos. How can I disable player embedding for a link in a label? NOTE: If the instructions below do not apply to the version of YouTube you are using you may have downloaded the new YouTube beta theme. To remove this theme click on the green circle at the top right of your YouTube site and in the dropdown list choose Restore old YouTube. Under the Embed button is a form field that contains some code. Click on that code and copy it. If you want to start the video someplace other than the beginning you can check the Start at: box and enter a time you wish to start the video. If you want to resize the video cllck Share, Embed and then SHOW MORE. In the Video size: drop down choose Custom size and enter either the height or width (it will update the other value automatically) and click Enter. Or choose one of the default sizes from the Video size: dropdown box. Copy the highlighted embed code above that will now be updated with the new size. On the Share this video pop up window click in the area under Embed to highlight and copy the embed code. If you want to resize the video click on +Show options. Next to Size: change either of the height or width boxes and the other will update automatically. Change other settings as desired. Scroll down to the bottom and click Save and return to course. Make sure you have resized the video so that it is small enough to fit into the middle column of your course page (see above). First you need a YouTube account. Visit https://www.youtube.com and click on Create Account at the top right of the page. If you already have a Google Account, then adding YouTube is very simple. Visit https://www.youtube.com, click Sign in in the top-right corner, and enter your Google Account login information. That’s it! How do I know if I have a Google Account? 1. User the latest browser versions of Chrome, Firefox, and Internet Explorer with Silverlight to have the most success. Make sure the video format you have created your video with is supported. 2. You can upload your videos from your computer or create and upload them using your webcam. Here's a support page on that. 3. You can upload from your mobile phone. iPhone, Palm Pre, and Android Devices have built in uploading. Other phones have to use email. This link will take you to the same page as above but look further down the page for Android and iOS help. ****When you paste your widget code into the editor make sure you choose the HTML code view (click on the double brackets at the top <> ) – this is a common mistake. Go to your settings and select Widgets. Click Create new and then Lists from the dropdown. For User Timeline, enter the Twitter URL of the user whose Tweets you want to display i.e. @cbc. For Favorites, enter the Twitter URL of the user whose favorites you want to display i.e. @cbc. For List, select a public list that you own and/or subscribe to in the drop-down menu. For Search, enter your search query (for advanced searches, use Twitter’s search operators). Make sure to select Safe mode if you want to exclude sensitive content, profanity, etc. If you like you can customize the design by clicking on "set customization options" specifying the height, theme (light or dark), and link color to match your website. You can also configure your embedded timeline to auto-expand Tweets containing media. Click Copy code and then copy and paste the code into the HTML page,label or block on your site. You’re done! This section is for troubleshooting problems with Moodle that are being caused by something external to Moodle such as: browser issues, network problems, firewalls in your home or business etc. Click here to view a screen-cast on using Pearson MyLab in your Moodle course.